If I were to ask you what the Genie, Rhapsody in Blue, Philoctetes and How to Hook Up Your Home Theater had in common, I’m willing to bet a few of you would know exactly who I am talking about. For the rest of you, whom I was amongst just a few years ago, all of these characters and short animated features are part of the body of work from animator and director Eric Goldberg. 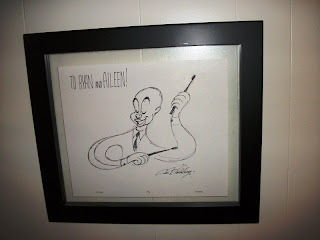 While his body of work has gone well beyond the scope of Disney, if I ran through a list of his animation projects (from commercials to attractions and feature films), we’d be here all day. It should suffice to know that he is responsible for many, many images that have permeated our pop culture for the last several decades. I had the amazing pleasure to be able to see Goldberg, along with his wife Susan, speak here in Asheville last March. It is worth noting that she is just as integral to our perception of pop culture as Eric is. The evening was incredible and featured many observations that young animators, whom were the target of the lecture, could cling to and merge into their own character, that’s personality not products of their art form. The stories and history, however, would have made any Disney enthusiast starry-eyed. However, we’re here to talk about Walt Disney World, right? As it turns out you can see some of Eric’s work each and every visit to Epcot, provided you take a tour through Mexico. Eric was one of the animators tapped to give fresh life to The Three Caballeros. Now, it is easy to bemoan the character conquest in Epcot, and I did love El Rio del Tiempo, but I’m willing to see the benefit here. Towards the end of its run El Rio del Tiempo did not hold the same crowds as it had once upon a time. The real draw to me though is the Caballeros themselves. Yes, they are animated characters, but they are characters featured in a charming films based upon Walt Disney’s cross-culture voyage to south of the border North America and South America. Saludos Amigos and The Three Caballeros were, for many decades, only fawned over by a select contingent of animation aficionados. The inclusion of these characters, and the rerelease of these films, have given a new life to Panchito and Jose Carioca, as well as Pablo the Penguin, the Aracuan Bird, Pedro the airplane, and a host of other lesser known characters. And Goldberg had a hand in crafting several of the scenes in Grand Fiesta Tour which revitalized these stories and characters. After hours of stories and clips last March, which could have been triple the amount of time and I would have sat and listened with a grin on my face, the Goldbergs’ session ended. The pair graciously agreed to stay after and speak with the audience one on one. While I understand that they were here for a week in different classes at UNCA (University of North Carolina at Asheville) and students would have more time to ask questions, to my shock and awe almost everyone left immediately. My wife took a few moments to take Susan for her stories and what her work meant to her, while I did the same with Eric. As luck would have it, he was also doing sketches for those who came. 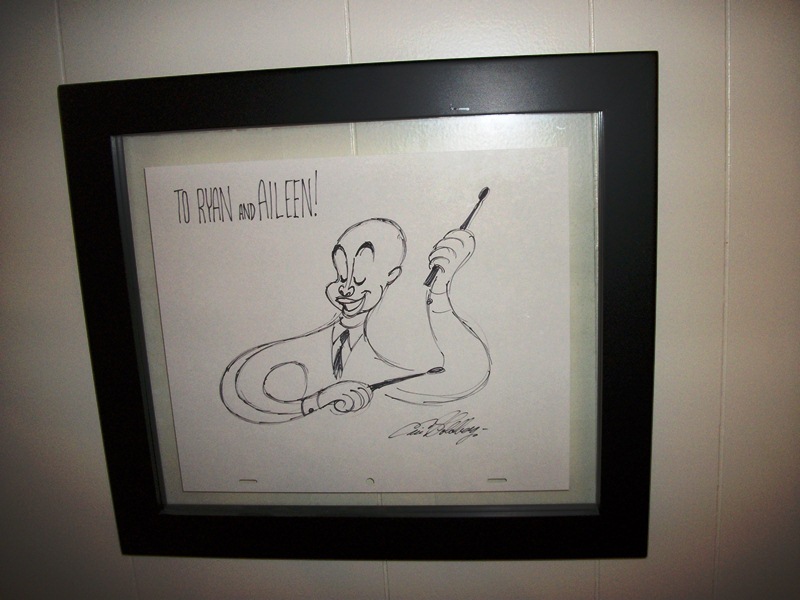 Many asked for his most notable creation, the Genie or some other famous character. I said I didn’t need a drawing, just listening had been treasure enough for me, but he asked what I would like. Because it is so dear to my heart, I asked for anything from Rhapsody in Blue and was rewarded with a gorgeous work of art of the drummer (whom is my favorite character from the short, but I didn’t dare go so far as to ask for this character). The next time you’re passing down the rivers in the Mexico Pavilion, watching Hercules, Aladdin, Fantasia 2000, Pocahontas, Winnie the Pooh, The Princess and the Frog or any number of Disney animated works, be sure to pay a little respect to the wonderful worlds the Goldbergs have created for us. Oh, and even if they aren’t part of the film’s crew, take a moment to ponder all the work and amazing individuals who created these incredible films and attractions. How much have they contributed to who you are? What a treasure to have on your wall! Awesome! And thank you for taking the time to talk to the Goldbergs; sounds like you spoke for all the fans who couldn't be there. Rich - I can only hope I handled myself well enough to speak for all of us! I really want to tape and photograph the event to share with everyone, but sadly it wasn't allowed.